Hair grows an average of 1-1.3 cm per month. But basically it's like you treat it yourself that affects the rate at which they grow. To grow hair faster you'll just have to take care of your hair and your whole body better. First of all, lead a healthy lifestyle. You need to eat enough fruits and vegetables, drink plenty of water and exercise regularly for the health of the entire body. You can also start using dietary supplements for hair and nails. Remember about the proper hair care. In addition to the right shampoo and conditioner, use the conditioners without rinsing. You also need a good, deeply moisturizing mask. Well moisturized hair is more resistant to drying and breakage. 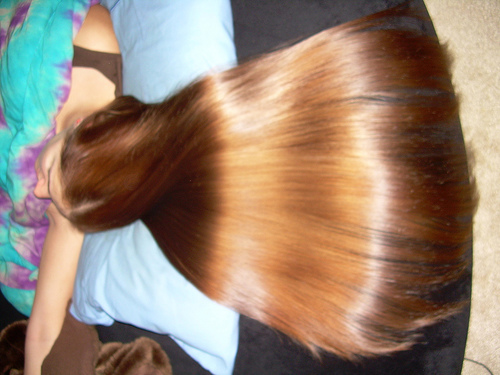 If you have currently dyed your hair and you see a lot of fractures and damage, you should consider discontinuation. Cut hair will help in getting rid of dry, damaged and split ends. Although it does not accelerate hair growth, however, they will look more healthy. You should minimize hair styling with using heat. Remember also to make delicate ponytails and buns that will not be too tight.